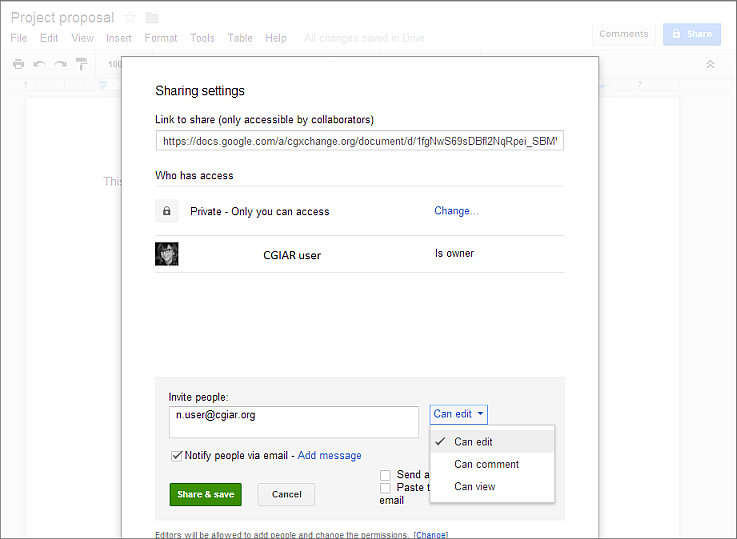 This short tutorial shows how to share Google Documents, Spreadsheets and Presentations that you create on your Drive, with CGIAR and non-CGIAR account users (i.e. users with cgxchange.org cgiar.org and non-CGIAR email accounts). Open the Google Document you wish to share from your Google Drive Web interface. Click on the Share button in the upper right corner. In the Sharing settings, you set the visibility of the document. You can share privately with individual users, or set the visibility option in bulk. Edit gives them rights to edit the document content, add people and change visibility and permissions. Comment gives them rights to add and reply to comments without modifying the document content. View gives them a simple right to view the document. In the Invite people box, type the email addresses of the users you would like to access the document. As you type, you will get suggested contacts from the CGIAR directory of contacts. When you see the one you wish to add, just click on it to add it to the Invite box. If the collaborator you wish to add is not in the CGIAR directory, simply type the address or paste it in the box. Google Group: when you need to share Google documents with a large group of collaborators on a regular basis, collect all their Google accounts and create a Google Group on cgxchange.org. This will create a handy mailing list address that you can use to Invite people, instead of you entering several email addresses each time. Public on the Web: no sign-in required. Anybody on the Internet can find and access. Good when you wish to publish a document with a simple link from a Web page. Anyone with the link: no sign-in required. Only people who receive the link will be able to access. Good when you wish to share a document with a team or group of people on an occasional basis or just for reference. If this link is published on the Web, people not originally invited can access the document. CGXCHANGE: sign-in required. People on cgxchange.org can find and access. Good when documents are not restricted access within CGIAR, but are not for circulation outside. Remember that in any of the above cases, you can give users permission to Edit, Comment or View. More in Sharing settings overview. Commenters can’t permanently delete a file or folder, nor can they change something’s sharing settings. Moreover, if you share a document for comments with anyone with the link, Commenters will be anonymous. 2. Send a notification from Drive (conditions apply): On the Sharing settings box, you can select Notify people via email – Add a message. By choosing this option, you will be sending a notification with the link to the document straight from Drive.